TRCA’s Planning and Development staff coordinate with other approval agencies, including municipalities as well as provincial and federal governments, providing technical review services and advice with respect to TRCA’s areas of interest (such as natural hazards and natural heritage). This includes input on municipal policies and by-laws, Planning Act development applications, and Environmental Assessments. TRCA works in coordination with regional and local municipalities in the Regions of Peel, York and Durham, the Townships of Mono and Adjala-Tosorontio and the City of Toronto. TRCA staff provide input and technical support in the development and implementation of Official Plans, Secondary Plans, environmental studies and reports and special municipal by-laws (such as tree, ravine, sediment and erosion control, fill and grading). Through participation in committees, workshops and studies, the TRCA provides valuable information and advice on flood control, stormwater management and the conservation of natural features and functions within its watersheds. As a public commenting body under the Planning Act, TRCA reviews and comments on development applications to protect and regenerate natural systems and to prevent, eliminate, or reduce the risk to life and property from flooding, erosion of riverbanks, and slope instability. TRCA also encourages opportunities for compatible public use and enjoyment. Through its Living City Policies, TRCA integrates its public safety responsibilities with ecosystem planning and management. As a requirement of the planning approvals process, development proposals adjacent to natural areas and the waterfront undergo review by TRCA. To expedite any approvals required from the TRCA, your planning application or building permit application may be circulated to TRCA through your local municipal Planning Department. For further information on navigating this process see our FAQs. TRCA is also identified as a commenting body under the provincial Environmental Assessment Act and federal Canadian Environmental Assessment Act. In this capacity, TRCA reviews and comments on Individual and Class Environmental Assessments (EAs) that occur within TRCA’s jurisdiction under the Acts. Proponents of an EA are required to identify and consult with government agencies, including TRCA, if the proposed project has the potential to affect an item related to TRCA’s areas of interest (such as issues related to natural hazards and natural heritage). The Ontario Ministry of the Environment and Climate Change and Canadian Environmental Assessment Agency are responsible for the administration of the provincial and federal Acts respectively, and for ensuring that proponents meet the requirements of the applicable act. See our Procedural Manual for guidelines on submitting EA materials for TRCA’s review. Download our EA forms and fee schedule here. Request a review or authorization. Although TRCA no longer review projects under the Federal Fisheries Act, the Authority continues to deliver programs and services directed towards the protection, restoration and management of aquatic systems, including fish and fish habitat, as an integral component of watershed management and our objectives for the Living City. 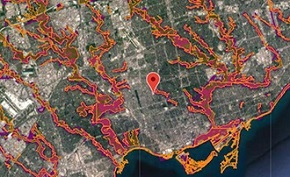 Since TRCA is responsible for administering Ontario Regulation166/06 under the Conservation Authorities Act for works within regulated areas it continues to provide quality service in this regard, including review of impacts on aquatic systems. In addition, TRCA also provides Plan Review services under the Planning Act and Environmental Assessment Act to our municipal partners including the provision of advice as it relates to impacts on fish and fish habitat.